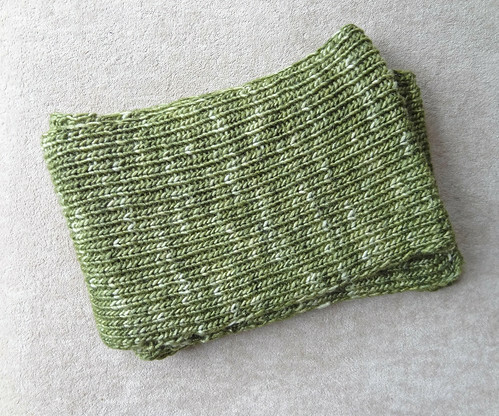 A very long time ago I blogged about a simple scarf project. I finished it a long time ago (beginning of June!) and then it waited a long time for blocking, and then it waited some more time for photographing. These are not great photos, but if I wait even more time for better photos, I will be blogging about this really simple project in 2013! So with no further ado, here is my finished scarf. I love this very simple scarf. It is a testament to how my knitting skills have developed. Instead of following a pattern like I did for my Striped Noro Scarf knitted in April 2009, I made it up myself. Not that this pattern was difficult, but I like the little touches I used to finish the scarf nicely. 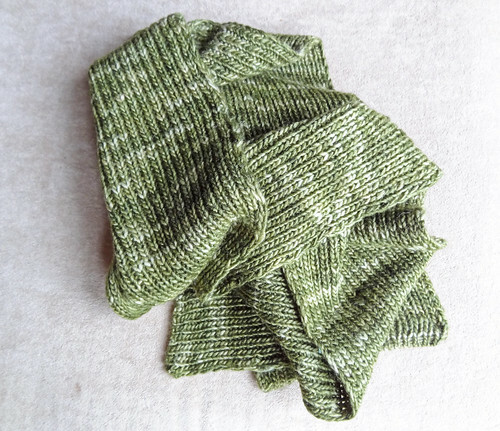 The scarf is a simple 1x1 rib, knit in Manos del Uraguay Silk Blend DK yarn. I alternated two skeins every two rows to prevent pooling and an obvious change of skein, part way through the scarf. I used 400m of yarn to produce a nice length of scarf (I haven't measured it and I can't be bothered to go downstairs right now to do so). 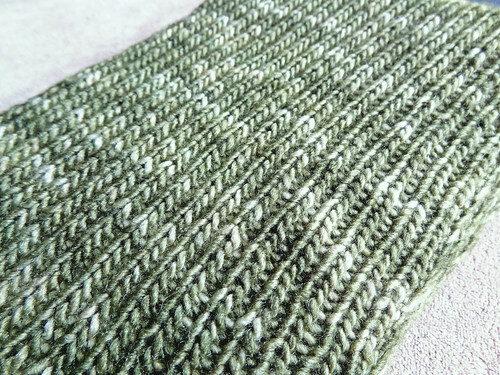 I used an odd number of stitches and knit the last stitch of each row, and slipped the first stitch of each row, purlwise, to create a selvedge. I was quite proud of myself for the way I began and finished the scarf, as I did some actual research before starting. I used a tubular cast on after finding it in The Principles of Knitting: Methods and Techniques of Hand Knitting . I found a great photo tutorial on Woolly Wormhead's website, if you want to give it a go, you can download the PDF. This is a good way to create a nice stretchy ribbed cast on that means the starting edge isn't a hard line, but matches the ribbing. 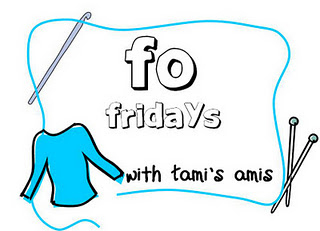 To cast off, I wanted to be equally clever, so I found TECHknitting's great tutorial for a tubular cast off. This creates two pieces of fabric, using double knitting, from the initial single piece, which is then grafted closed. I even used her version of grafting which uses knitting needles instead of a tapestry needle. I can't work out which, end of the scarf, is which on the above photo! If you have it in your hands and stretch it open you can just about work it out, but is the only way. I haven't learnt all these techniques in the last three years, I only learnt them in time to do this project, but the difference in my knitting skill is I knew to go looking for them. I knew there was a way to have nice stretchy cast on and cast off edges, so I went looking for them, and I have the resources to find them. 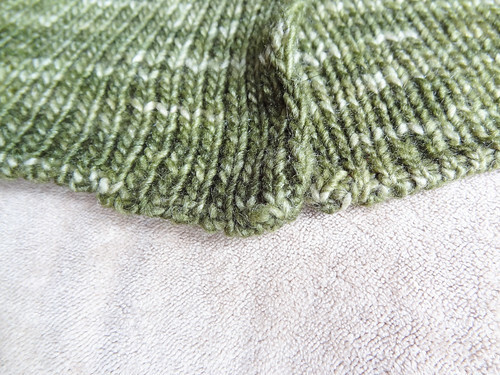 I knew how to do a selvedge and I knew to alternate skeins of yarn to avoid pooling and a marked change to the yarn. I didn't know those skills three years ago. My new skills mean I have a beautiful scarf, which I even blocked because I wanted it to be the ultimate ribbed scarf. It drapes beautifully, it feels soft and elegant and I LOVE it! I couldn't be happier. All the effort to utilise new found skills have made a real difference to how this scarf turned out. No one but another knitter would see those differences, but they make all the difference to me. I hope that it signifies how far I have come in my attitude to knitting. I want to make everything in the best way that I can. I want to be able to take pride in my knitting. I also want to keep learning everything I can as I become more confident in my knitting skills. I never want to stand still and say - I'm a good enough knitter now. One of the things I love about knitting is that you can never know everything. I'll never have to stop learning. To see what other people have learnt, click on the button!